Toronto, known to some as The Big Smoke, has world class horrible traffic and at least a fair smattering of all your basic urban ills. The city that knows no hockey also has some unexpected lesser-known natural and historic charms. To begin with, the Toronto Islands get less attention than they deserve. Enough said. Stay away. Then of course there’s Cherry Beach where a person can emerge on a warm summer evening from a stand of cottonwoods along a sizeable sand beach and paddle a canoe or travel under sail on Lake Ontario in the relative shelter of the human-made, now forested, Leslie Street Spit just on the outer side of the islands while watching the Toronto skyline pass silently, rather surreally, by in the distance. However, my principal unknown pleasure of Toronto is upriver from the lake along the Don River. 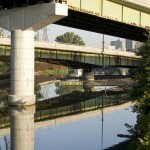 The Don ends ingloriously when it submerges under the concrete of the Don Valley Parkway (DVP) just north of the lake. However, thanks to the efforts of urban conservationists, the Don actually flows quite gracefully in wooded areas just out of sight of the DVP. The real charm is in the neighbouring ravines of Carolinian forests that create a maze offering surprising delights to anyone who takes any number of trails down into the valley. 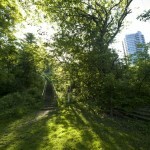 The oddest spot is just where the Pottery Road crosses the Don River. At the bottom of a steep hill two at the bottom of the valley odd-fellow historical sites sit side by side. From the mid twentieth-century: Fantasy Farms. This rather bizarre venue has been a place for newlyweds to tie the knot since the 1940s. Service clubs meet there occasionally, but its main business is still weddings. 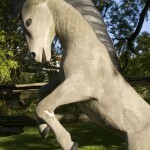 With its medieval, fairy tale exteriors and horse statuary on beautiful grounds with enormous willows, Fantasy Farms is about as camp as Toronto gets. It’s common to meet elderly Torontonians who remember a wedding or their high-school prom there. Across the street: Todmorden Mills. With its brick smokestack and nineteenth century buildings Todmorden Mills presents a puzzling face to drivers whizzing by on the DVP. The area was travelled by indigenous groups using the Don as a means to enter Lake Ontario or to ascend the river into the area known now as the Oak Ridges Moraine. Since 1793 Todmorden has been, among other things, a sawmill, a distillery, a paper mill that supplied William Lyon Mackenzie’s Colonial Advocate, a brickworks and a prisoner of war camp during World War II. 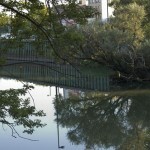 These days trails are being rehabilitated around a pond bordered by indigenous plants and flowers; a theatre group uses one of the industrial buildings; a small historical centre is housed in one of the houses from the early nineteenth-century. A local historical restoration concern is even conducting test digs along the nature trails in search of evidence of the aboriginal and settler past. Fantasy Farms and Todmorden Mills sit along a Don trail system that’s increasingly extensive. The efforts of those who have removed garbage and planted trees is bearing fruit. Last fall, I saw a healthy red fox emerge from the valley near Queen Street. If one wants to combine some reclaimed urban nature with local history just head slightly north along Pottery Road as you stroll or bike through the Don. The DVP will remain as a testament to a time when North Americans believed urban river valleys were destined for expressways alone, but Torontonians are slowly pushing back. Robbins, Li “Hot To Trot,” Toronto Life, June 2004. Sauriol, Charles. Tales Of The Don. Toronto, Natural heritage/Natural History Inc., 1984.